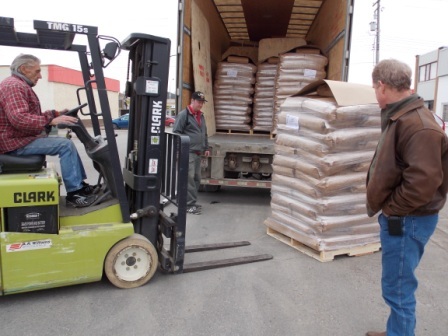 Andrew Bronson is watching Lethbridge Food Bank staff unload 10,000 pounds of Quick Oats. This is part of the 14,500 pounds donated this year. Total donations from the combined efforts of the 4 Rotary Clubs is over 53,000 pounds.